5 Essential Grooming Tips on Keeping Your Pup Clean and Happy! Ahhh, there’s nothing more relaxing than a bath, is there? It always feels great to be pampered, and your four-legged friend more than likely agrees with you. Grooming your furry friend regularly provides many benefits for your dog. It allows you and your dog to have a special bonding time together, promotes your dog’s good health, lowers stress and blood pressure levels in both you and your dog, and allows you to become familiar with your dog’s body. When it’s time to clean up your pup, remember to try your best to bring a good attitude, positivity, and lots of patience. Remember, this is a fun, relaxing time for your doggy and you to share together. Read on below for tips on how to make the most of grooming time! Brush Up Your Grooming Skills – Want to help keep your pup’s shedding under control? Grab a doggy brush and start grooming! Your friend should be brushed every few days to help promote healthy hair growth and to weed out dead hair and skin cells. Grooming your dog outside is ideal, especially if your dog sheds a lot; however, if the weather won’t cooperate, a room with hardwood or tile flooring works just fine. It’s also best to brush your buddy before bathing him because it makes brushing him after the bath that much easier. 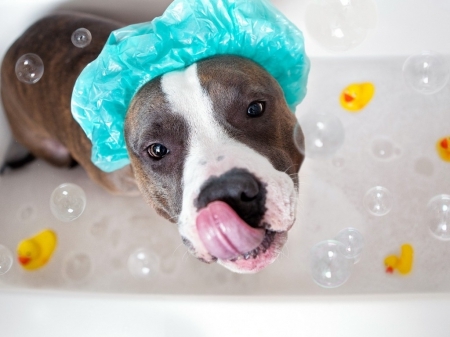 Give Your Dog Regular Baths – First off, make sure that you use a shampoo that’s made specifically for dogs. Human shampoo is too harsh for your dog’s skin and coat. Lather up your pup’s coat and rinse it thoroughly to avoid leaving any soap on your dog’s skin. Also, regular bathing can help reduce a dog’s shedding, but too much bathing can also strip the dog of his natural oils. Find out here how often you should wash your furry friend! Keep Their Teeth Healthy – This one might be tricky to do, and you will need quite a bit of patience to let your dog get used to it. Start by using your finger on your dog’s teeth and gums, pretending that it’s a toothbrush. It might take quite a while for your pup to become used to having his lips being lifted and his teeth being touched, but with love and patience, he will become accustomed to it! After your dog has grown used to it, slowly progress into using a toothbrush and toothpaste. Give Fleas the Boot Naturally – Nobody likes fleas, especially your four-legged friend. Keep your pup happy and flea-free by preventing fleas. If you’re worried about using any potentially toxic materials, try preventing them the natural way! Wash your dog and his bedding often, use a flea comb every day, vacuum frequently, and use soapy water as a dip to eliminate any fleas that might be present on your dog. Wipe Your Pup’s Paws – When it’s wet outside, make sure your dog comes back inside with clean paws! Keep a nylon mat with a vinyl or rubber backing inside the door and an old towel at the ready to wipe your pup’s paws and dry him thoroughly. We promise you that he will appreciate the extra attention to detail! At BauserHaus, we want to make sure that your dog is healthy, happy, and pampered. That’s why we will provide your four-legged friend with a bath and brushing service when you bring him in for daycare or boarding. Leave the nail trimming to us, too – we also provide that service for your pup! Call us today at (314) 961-3911 to find out more or bring in your pup if you’ve already been here! This entry was posted in Tips and tagged BauserHaus, dog grooming tips, doggy daycare STL, how often to bathe dog, how often to brush dog, how to keep dog clean, how to keep dog happy. Bookmark the permalink.